Astronauts on the International Space Station have transformed their high-flying laboratory into a new kind of launch pad for tiny satellites in a bid to boost student interest and access to space. This month, the space station's Expedition 33 crew launched five tiny Cubesats, each only a few inches wide, using a small satellite orbital deployer from Japan's space agency JAXA. 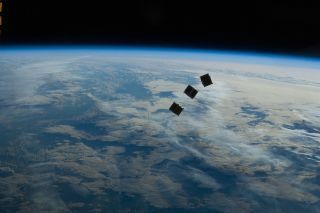 They were the first Cubesat satellites ever launched from the International Space Station, coming 2 1/2 years after NASA announced the CubeSat program. TechEdSat measures only 10 centimeters across and cost less than $30,000. This image was released on Oct. 4, 2012. "This was a learning experience for everyone," said Andres Martinez, the NASA Ames project manager for one of the satellites. "Fifty-five years ago we launched the first satellite from Earth. Today we launched them from a spacecraft," space station commander Sunita Williams of NASA said on launch day to mark the moment. "Fifty years from now, I wonder where we'll be launching them from." The JAXA satellite-deploying device arrived at the station aboard a Japanese cargo ship in July. Japanese astronaut Akihiko Hoshide placed the deployer, which is about the size of a small rabbit cage, into a small airlock in the Kibo lab. Then, the astronaut sealed the airlock, opened it up to space, and commanded the station's Kibo robotic armto pick up the deployer and bring it outside for satellite deployment. All told, the procedure took only four hours of astronaut time – with no spacewalk required. "If you can imagine, deploying satellites from station can be quite risky," Martinez said. "We were going through that whole experience of conducting analysis to ensure this would be something safe to do from station, not only from the point of deployment but also taking up the satellites inside station." One of the cubesats launched from the space station was TechEdSat, a 10-centimeter-wide (3.9 inches) satellite that Martinez oversaw. Students at San Jose State University were responsible for most of the design and development work. The students are operating a ground station where they will be able to listen to signals from TechEdSat. The satellite periodically sends out packets of data with information about its temperature, orbit and other parameters explaining its environment in space. The project cost about $30,000, excluding labor and launch costs. "It's a huge STEM success," Martinez said, referring to NASA's program for attracting students to the fields of science, technology, engineering and mathematics. He added that NASA Ames made sure the students were prepared to meet the rigorous standards of the design and development process. Anything that goes on to the space station must meet strict safety standards, including making sure there is no fire risk. Satellites in particular have items such as batteries and wires on board. The satellite cube is expected to exceed its initial design lifetime of a month, but Martinez declined to give specifics because the final parameters for the design and orbit have not been analyzed yet. Only one major objective will be unmet. Initially the satellite was supposed to compare OrbComm and Iridium communications techniques in space, but there was not enough time to meet the licensing requirements before the launch date. Small Satellite Orbital Deployer (SSOD) attached to the Japanese module's robotic arm is featured in this image photographed by an Expedition 33 crew member on the International Space Station. Several tiny satellites were released outside the Kibo laboratory using the SSOD on Oct. 4, 2012. Of the other four satellites released Oct. 4, one of them, F-1, was a collaboration of Houston-based space hardware developer NanoRacks, Uppsala University in Sweden and FPT University in Vietnam. The other three satellites were from institutions working with the JAXA. The satellites were called RAIKO, WE WISH and FITSAT-1. The latter satellite is designed to write messages in the sky inMorse code, with the aim of letting researchers test out optical communication techniques. Cubesat flashes should be observable by the unaided eye or with small binoculars. NASA chose to release the satellites in two batches to minimize the chances of collision with the station, Martinez said. As the satellites have no maneuvering capability, NASA calculated a trajectory that would make it very unlikely that the cubes' orbit would ever intersect with that of the station. With the success of the launches, NASA is on its way to reducing the expense of civilian access to space. It is cheaper to deploy a satellite from the space station than from Earth. "The whole idea is about lowering cost," said Victor Cooley, the space station's Expedition 33/34 lead increment scientist, in a recent interview on NASA Television. "If we can lower the cost by these payloads being a secondary payload on a rocket ― or, in this case, HTV [a Japanese cargo vehicle] which is already carrying cargo to the station ― that makes it an even lower cost for the smallsats to be deployed." There are no firm plans for when NASA and JAXA will do such an exercise again, but Martinez says there is a "very large pool" of students and engineers who are eager to take part. "It got attention to the very top of NASA, and everyone is super-excited," he said. Follow Elizabeth Howell @howellspace, or SPACE.com @Spacedotcom. We're also on Facebookand Google+.